It goes without saying that you should have a glass of wine while working on this project, right? I acquired a couple of blank trays at a craft store years ago. And I’ve kept nearly every wine cork from nearly every bottle of wine I’ve had for years with the long-delayed idea to make something with the corks. And I finally did! Dale modeling the cork cutting device! 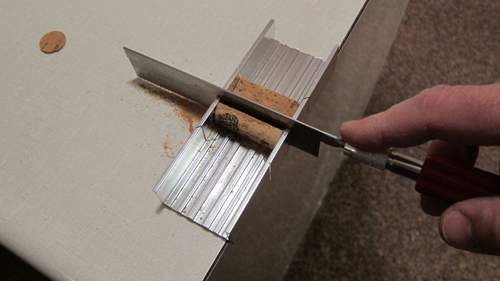 First, I cut the corks in half using a small mitre box saw set. Long, steady strokes of the saw worked best for me! And, happily, the box fit the corks almost perfectly (though they were a snug fit). Cutting them in half also allowed me to pick out corks that were of roughly the same thickness to create an even tray. 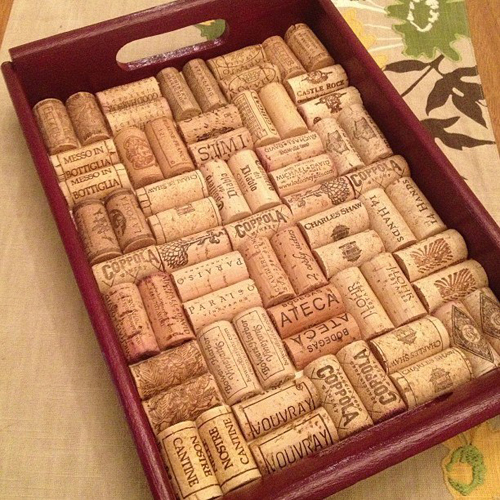 Once I had enough corks cut I had to create a pattern that fit into the tray I purchased. Kudos to Dale for coming up with this pattern. 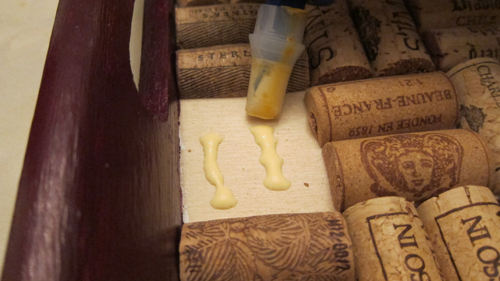 I also had to make cuts to the edges of the corks to ensure a proper fit inside the confines of the tray. 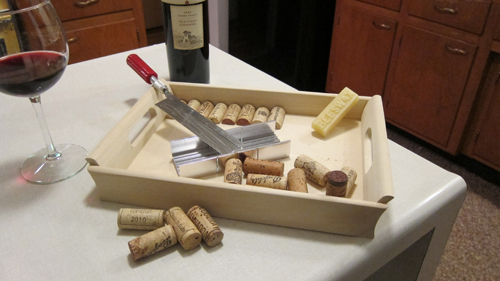 Lots of instructions I’ve seen online just magically have a tray that fits corks. Also, cork length varies by brand so fitting them altogether is the most challenging part of this project. I set them all in and arranged them to my liking before I started gluing! Next, I pulled the corks out, set them aside in order of how I wanted them to be laid out and then I turned my attention to the tray itself. 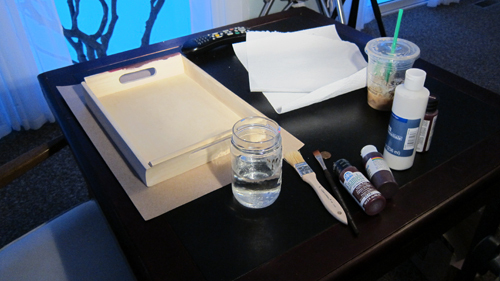 I decided to paint the tray the color of red wine. I had more than one tray, and I primed one but not the other. I would opt to not prime in the future—the primed one just didn’t look as great! Finally, I had to put the corks in, one at a time. I used wood glue but you could easily use a white glue like Sobo. And the final product! I liked how it turned out! Now I have a cute and functional wine cork tray for parties and entertaining. “Call me Martha!” What fun! Nice work! I had started a collection of corks some time ago for the same project. difference is, you actually do these projects! Kudos! I was thinking I would pour the self leveling bar sauce on mine. Thoughts? Self leveling bar sauce? I have no idea what that is but I like the idea of it being wine that you pour over it that stains the corks but then congeals and seals like a paint. But it probably wouldn’t be wine anymore and that would be sad! what u do with beeswax????? you didn’t say. You’re right! I used it on miter box but it didn’t end up being an integral part of the project. Sorry! It was to grease up the little saw! I didn’t end up using much. Sorry I wasn’t clear!